In an attempt to escape the heat of a summer day, we took a walk along the pier at Queenscliff. 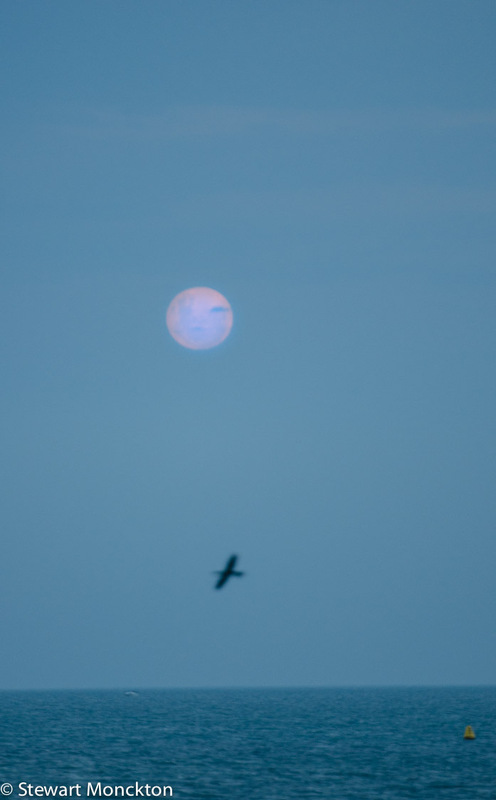 There was a full Moon of a strange are rather wonderful colour. I think it may have been caused by smoke in the air - but it could be just that it was damn hot! Due to me being rather busy this week, I thought I'd go with a bit of a crowd pleaser for WBW! 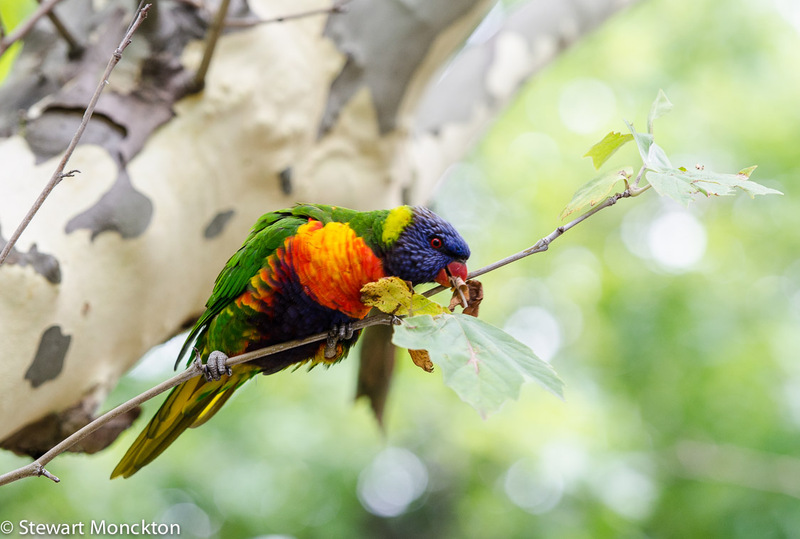 A few weeks ago, as I walked to the train, I noticed a group of Rainbow Lorikeets in the trees near the station. The next day I took my camera - confident that the birds would not be there. But they were, so I stopped to take some pictures - and (surprise, surprise) I missed my train! Oh well! 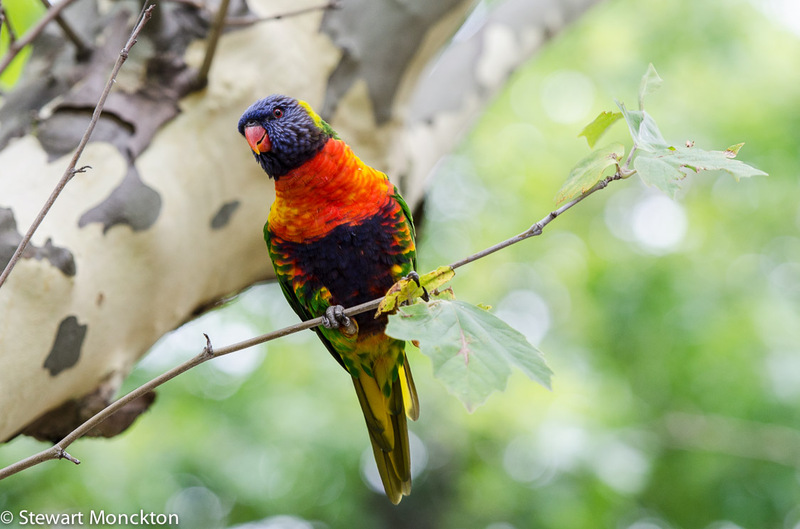 The Rainbow Lorikeet (Trichoglossus heamatodus) is about 25 - 32cm long and is insanely brightly coloured! The genus name makes reference to the birds hairy tongue that is used to lap nectar from flowers. 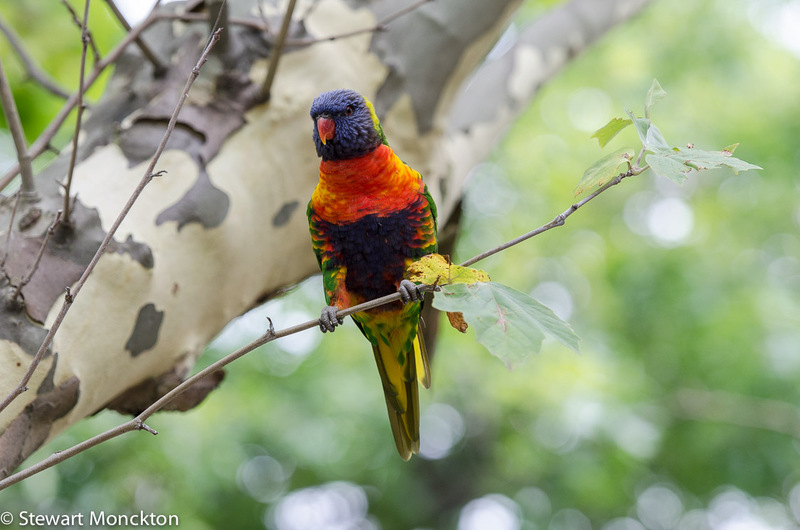 Lot that long ago, these birds were not common in suburban Melbourne. But now, possibly due to the presence of now mature street trees, they are rather common. Common, but rather splendid! Now it's over to you. A special plea now that the link widget has changed - could you limit the text that comes with the thumbnail to a name and a location (i.e. Stewart M, Australia or Fred Flintstone, AZ). At present the widget automatically puts in 40 characters of the URL as the label and it can look a bit of a mess! Click on the link and off you go. 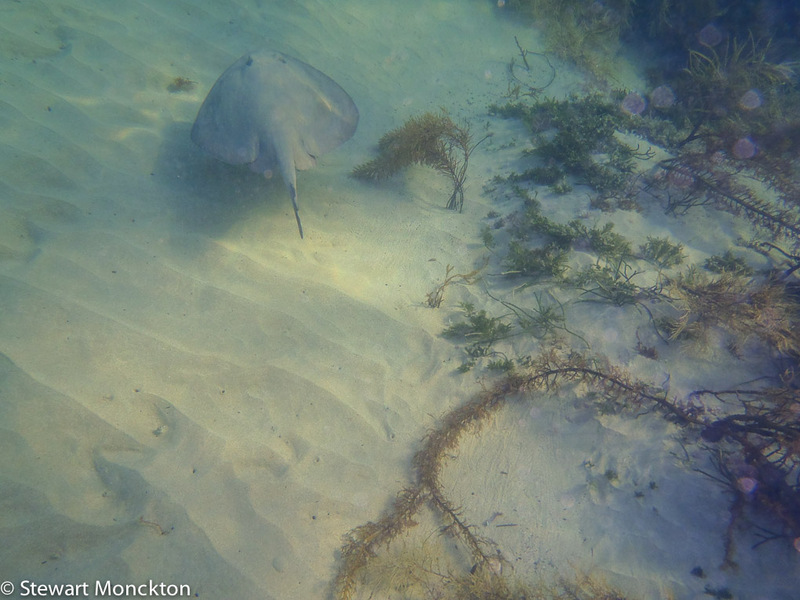 I had some great snorkelling trips during the summer holidays - and as the seasons turn I hope to be able to sneak in a couple more before the water gets a bit chilly. These are some of the better images I managed to take over the summer - I am often surprised by the quality of the images that come out of my little waterproof point and shoot. 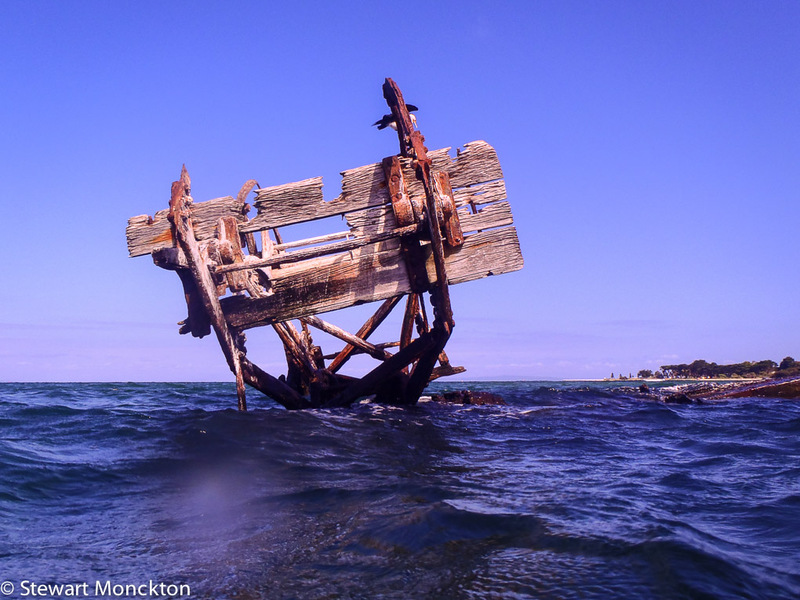 On the wreck of The Ozone. 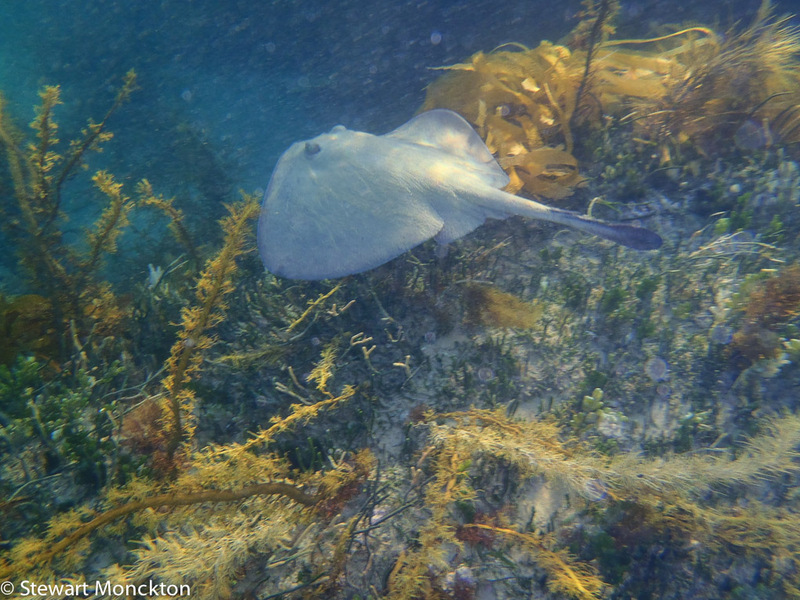 You can find more images and words about these trips in my wordy post - Reef, Wreck and Pier. I will attempt to reply to comments - but don't hold your breath! 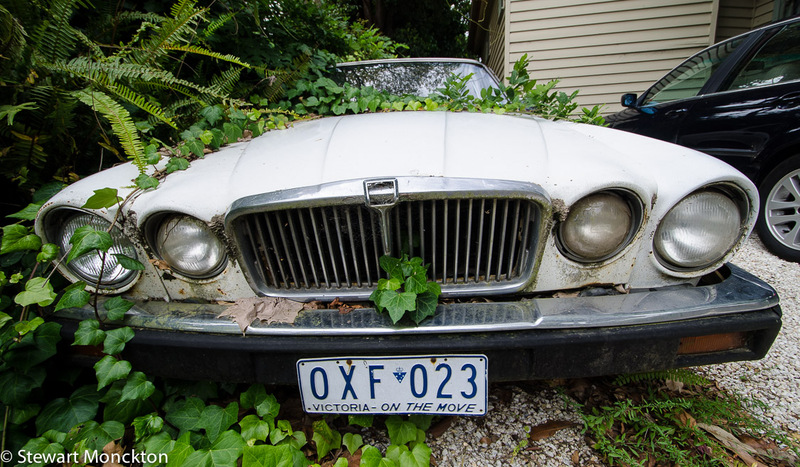 I have watched this Jaguar slowly become more and more hidden in the bushes as the years have gone past. I walk past it on the journey home. Much as I am not real fan of petrol guzzling sport cars, the slow extinction of this big cat seems rather sad! 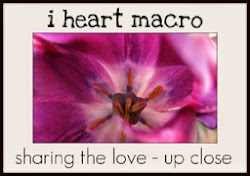 You can find more macro type shots at Macro Monday 2 and I Heart Macro. This was another image I took at the beach. 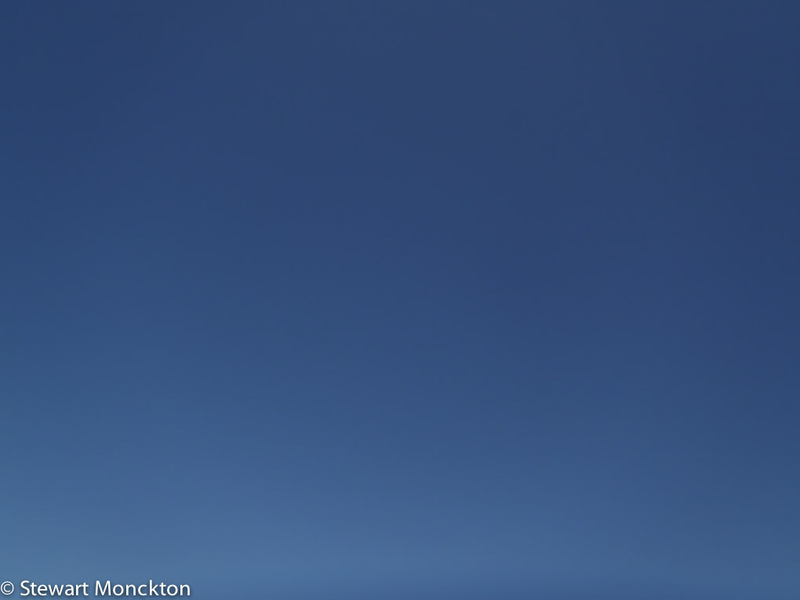 As you can see its just a blue sky. 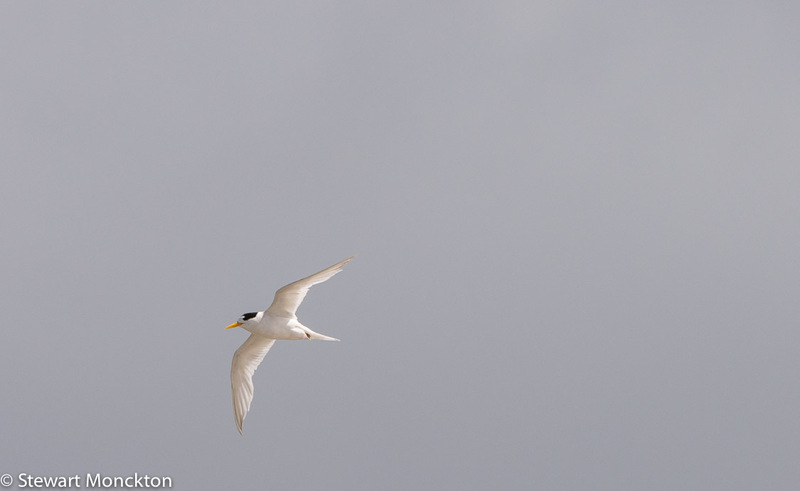 I was back out on Mud Islands on the weekend - and one of the highlights of the trip was a flock of around 20 to 25 Fairy Terns. 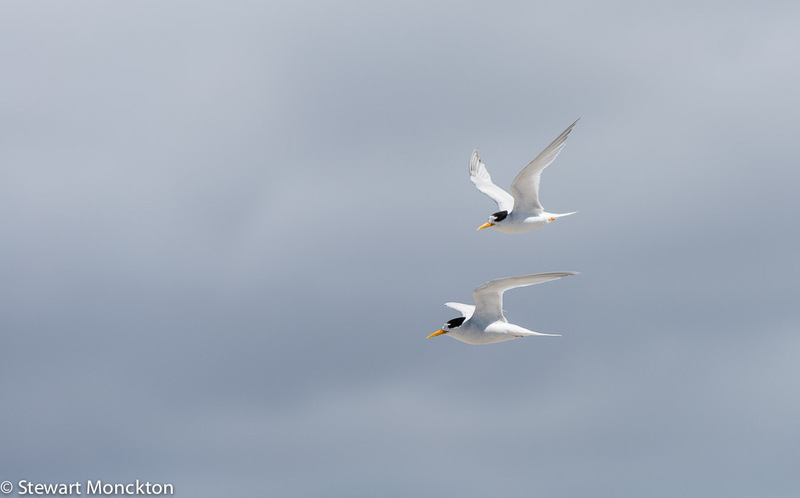 These are rather small terns which I have never managed to get any decent images of in the past. The Fairy Tern may have been called this because of its very pale wings that almost seem to let the light through them - this does give them a very delicate look. 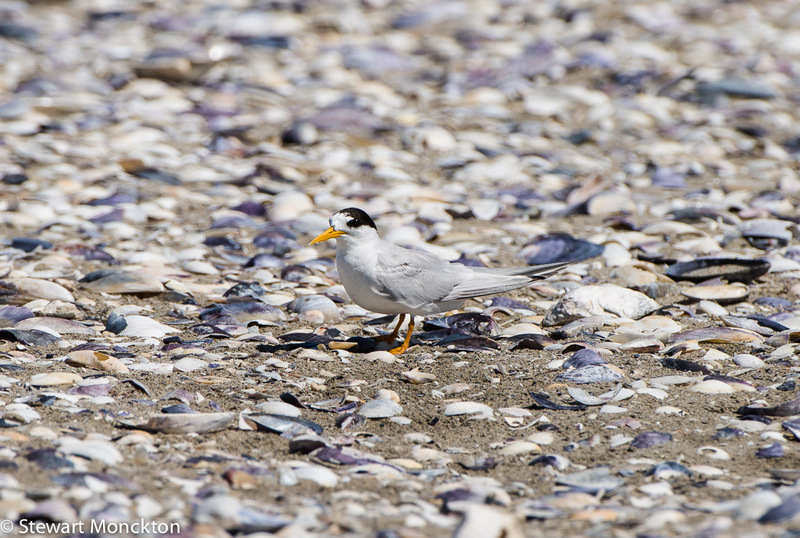 These birds are only about 21-24 cm long, and like most terns they do seem to have long wings. Getting these shots (which have been cropped a bit) was not made easy by the presence of two Pacific Gulls on the beach that seemed to delight in flushing the terns just as I was getting close to them. All in all these tern were a bit nervous. 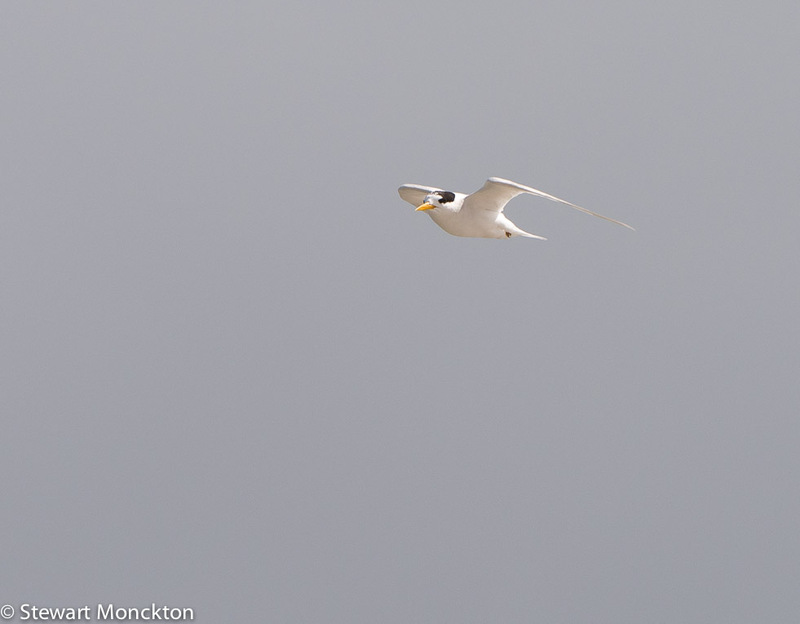 I was pretty pleased with the in flight shots - and I think they were made a little easier by the presence of a grey sky. I am not sure how the exposure would have gone if there have been a bright blue sky. 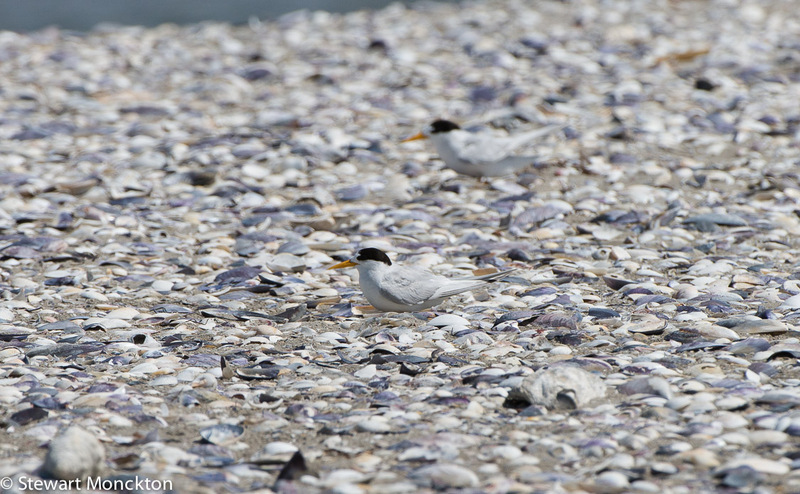 Parts of the beach where the terns were landing was coated in shells. When the birds landed they were surprisingly hard to see. Now it's over to you: click on the link below and off you go. 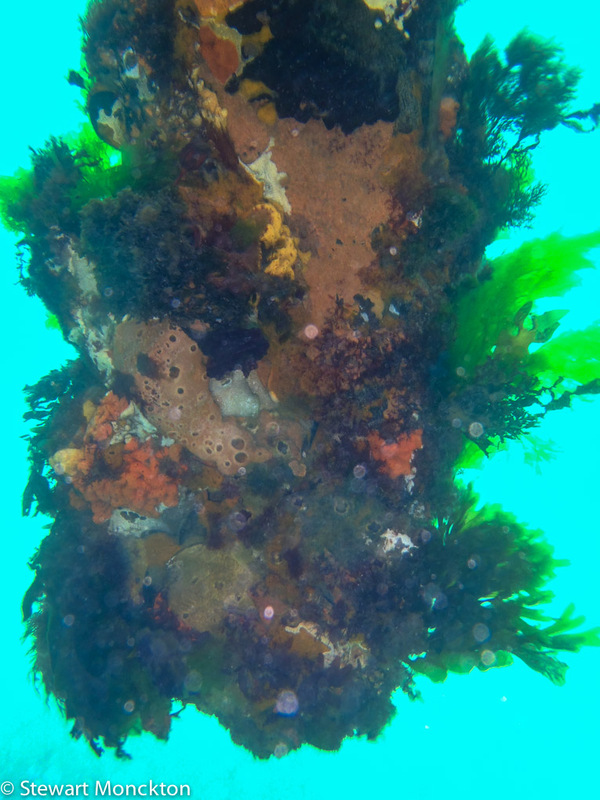 Mud Islands are two very low lying islands in the middle of Port Phillip Bay. Although "The Bay" looks big, much of is is very shallow and any large ships have to take a rather long winded route from the mouth of the bay to the port of Melbourne. The shipping lane actually follows the old route of the river Yarra which was flooded at the end of the last Ice Age. As I was watching these birds - Pelicans, Black Swans and Bar-Tailed Godwits - this large boxy ship drifted into view. I like the way the boat seems to be growing out of the land. I am also constantly amazed out just how ugly many of the ships that sail our waters are! The end of the road…..
Like most of you out there in blog-land I try to take pictures that are interesting. This often means we take pictures that are easy to look at. This may not be the case with this image. At present I am working on some words to do with full-circles, journeys, beginnings and endings - these will appear (with luck) on my wordy blog in a couple of weeks. This is one of the natural encounters that starting me thinking about this. 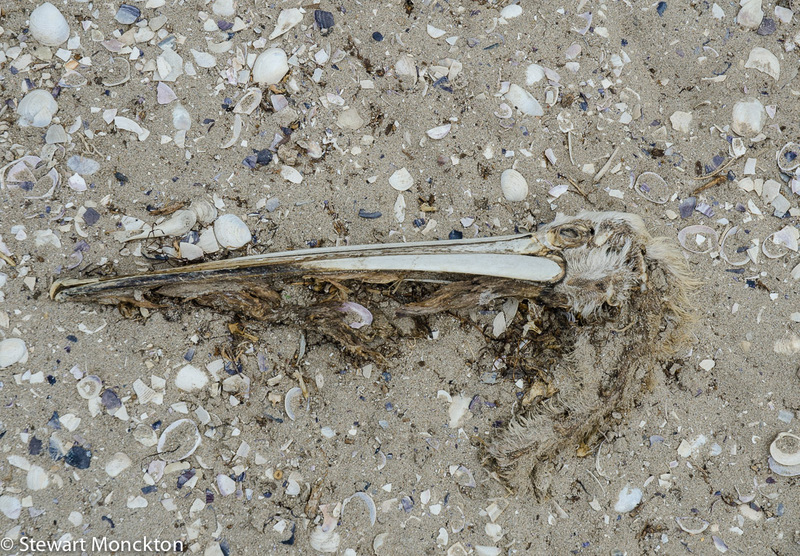 It's all the remains of an adult Australian Pelican that I found on the edge of a breeding colony on Mud Islands in Port Phillip Bay. The successful chicks and adults had all left. The colony was empty apart from the remains of the birds who came to the end of the road this season. I was drawn to the way the bird seemed to be turning back into sand - being turned back into the building blocks of new life in the age old process of decay. I'm 78.4% (+/- 2.8%) sure that this statistics course has broken my brain. I am aware however, that this is based on an invalid sample size (i.e. 1) and that my findings may have no significance! As a result I offer an apology for not replying (yet) to the nearly 100 comments in my inbox, and offer this sky shot by way of recompense! 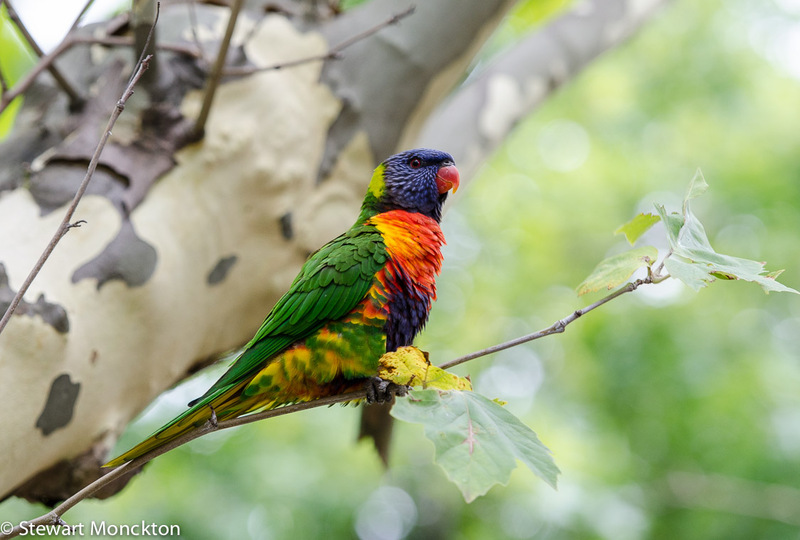 Today, I join the fine tradition of posting images of birds I have taken through windows! 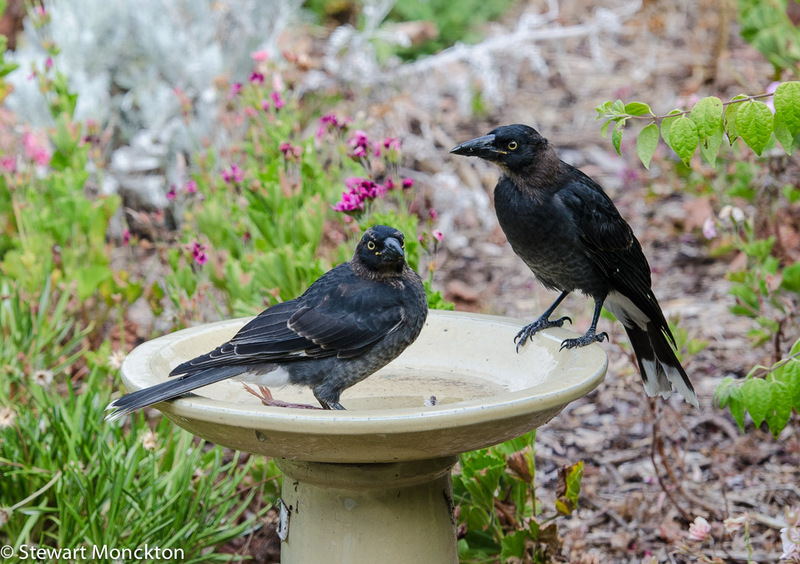 What I find remarkable about this is that the 3 images of the young birds on the bird bath were also taken through a fly-screen. It just goes to show how, if you can throw objects in the foreground out of focus enough they seem to disappear. 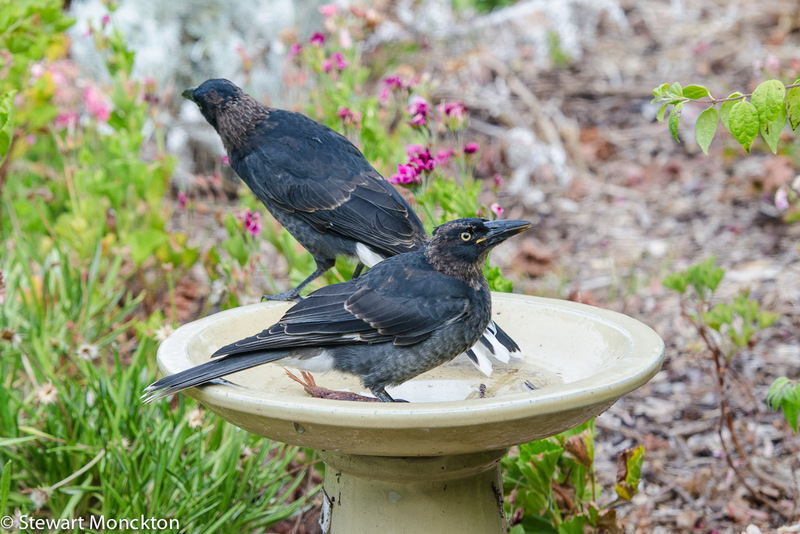 The birds on the bird bath are juvenile Pied Currawongs - Strepera graculina - a bird that is found along all of the east coast of Australia, but does not occur in Tasmania. 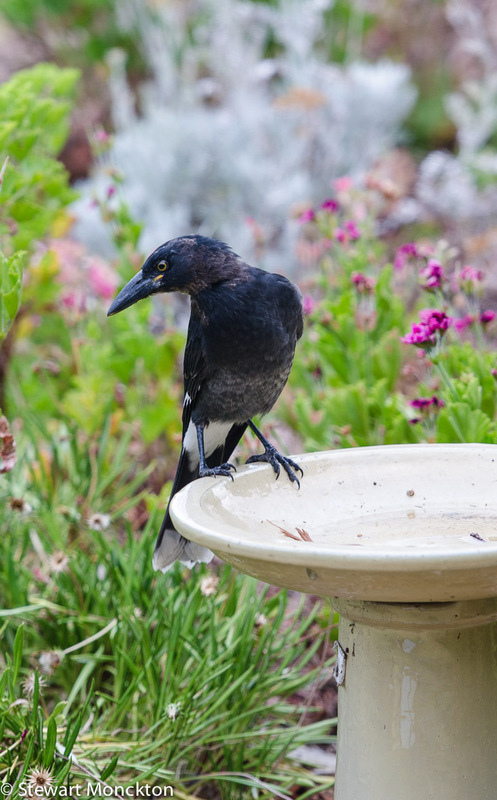 Although these birds look "crowish" they are more closely related to the Australian Magpie and Butcherbirds that true crows. They have a remarkable voice - you can hear a little of there voice by clicking the player near the bottom of the right hand side of this link. 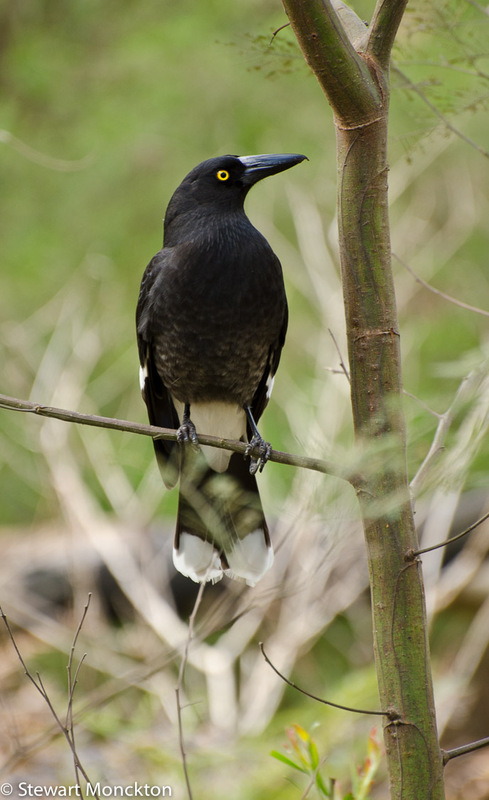 Currawong is probably a corruption of an onomatopoeic Aboriginal name (thats a hell of a sentence!) - but its scientific name means "Jackdaw-like noisy bird" - which is surly correct on the noisy part, but a little way of the mark on the Jackdaw bit! In flight I always think these birds look long and thin, and they have long wings that seem to have a slight pause, giving the bird a gliding sort of flight. For a long time this was a bird I associated with autumn, as they would be calling from the trees around the school I used to work at as I arrived in autumn mornings - not hearing them as often as I once did is one of a very short list of things I miss about that job! The part of the beak where it hinges is called the "gape flange" and in many young birds it is brightly coloured - you can see this is the bird batch images. This may act as both a marker of the health of the bird and as feeding stimulus for the adults. This is the adult bird in pretty much all its glory. You can see the small hook on the beak which is a bit of a give away about its rather predatory diet. These birds often eat the chicks and eggs of other birds - and can do a bit of damage to songbird nests. But a birds got to eat! 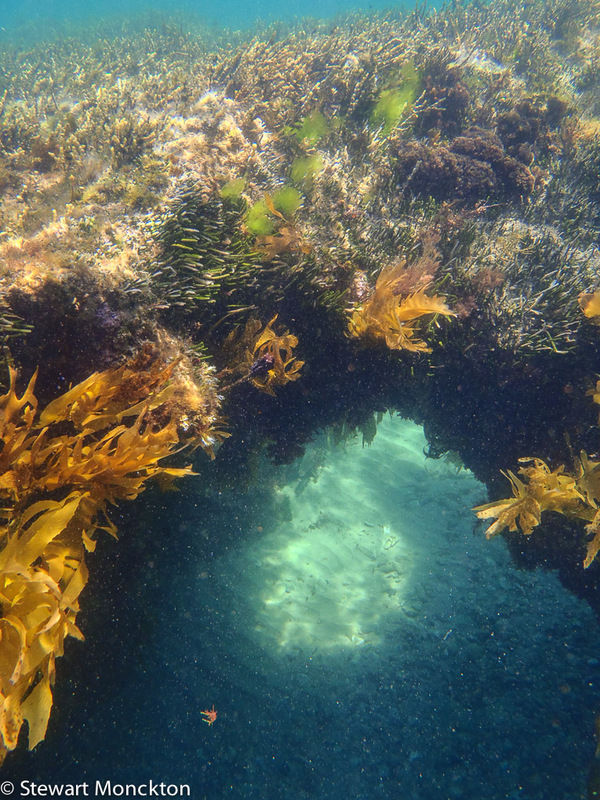 One of my favourite places to visit is an artificial island in Port Phillip Bay called Pope's Eye. I've mentioned it a number if times in these posts - it was build as part of the defences for Melbourne when it was one of the richest cities in the world - there was a gold rush going on! 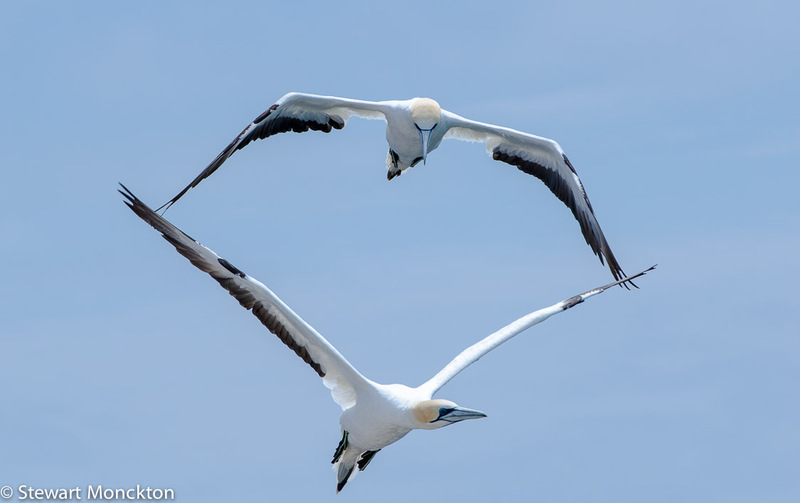 Now its how to a colony of Australasian Gannets. I could watch them for ages - and I always take lots of pictures when I go there. This is an image from my most recent visit - although I going there again on Sunday! By the middle of the week my brain is likely to be an addled mess - I'm doing some training in statistical analysis - and after one day I feel that I may drown! Please forgive slow responses this week - or if I send you a message about Item Response Theory that makes no sense! I'm sure there must be a story behind this abandonded bike lock. Was it lost and then painted? Did the owner come back to collect their bike only to find the lock still covered on wet green paint? There must be a story! I see this lock and seat every time I walk home - and I almost always wonder why or how. I think you should make up a version of the story! When I was a kid, if you put anything on your arms or legs when it was sunny, it was called "Sun Tan Oil" - the aim (as far as I can remember) was to help you go brown! My father would sit in the back yard and bake himself lobster red, wait for the skin to fall off and then do it all again - buy the end of the summer he was the same colour on his chest as a hazel nut - how back would still be white, because he just sat in a chair! Jump to today and things are very different. We slather ourselves, and more so our kids, in sun-block and at the beach we take shelter under rather clever self erecting tents. 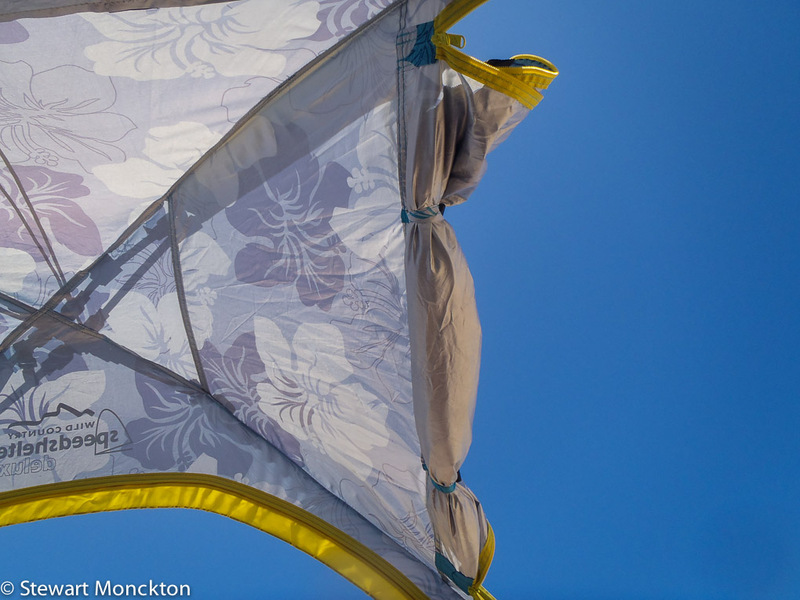 These tents come in a range of rather lurid colours - ours is no exception - and they can stud the beach, looking like strange psychedelic mushrooms - which is ironic when I think about it! This is the view from within your shelter! I can understand why all these changes have occurred, but it's such a loss for kids to look up into the sky and see an enemy, rather than a marker of long days of freedom. PS: don't forget the factor 50+! 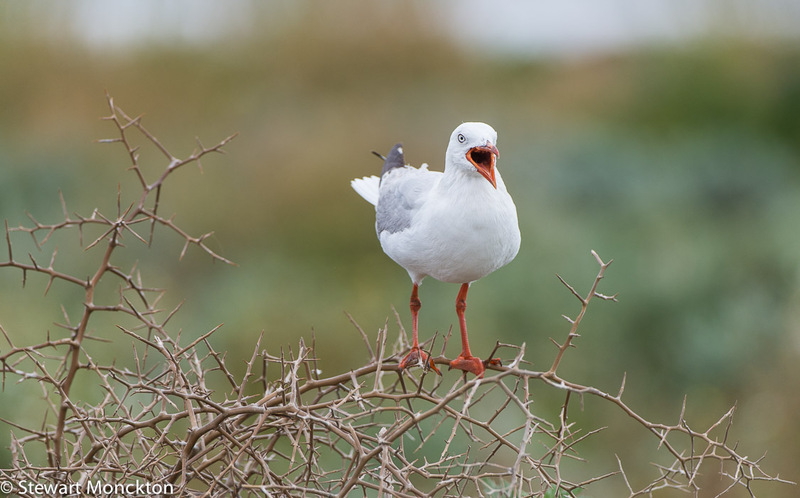 Australia is not overly blessed with gulls - and the silver gull is by far the most common. This is the generic "seagull" of family holidays, chips shop hit and run raids and sporting ovals. 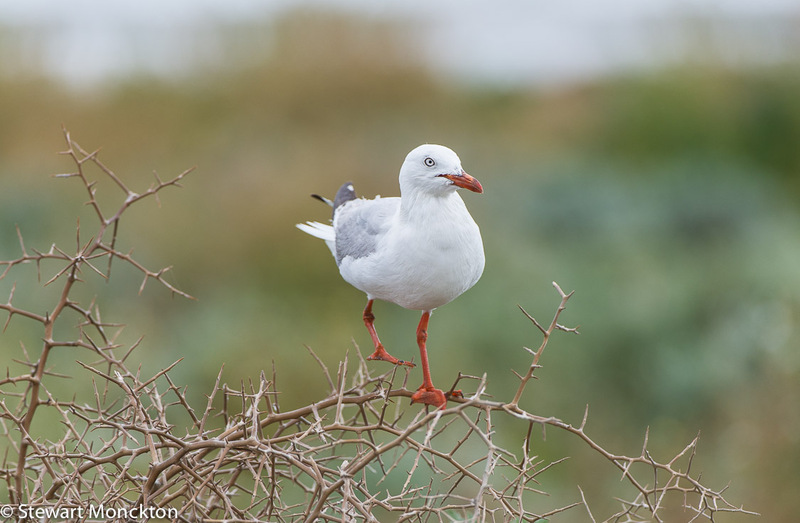 Most of the time, if you see a gull in Australia it's one of these. The scientific name of the species - Chroicephalus novaehollandiae - hides a little history of this continent country. 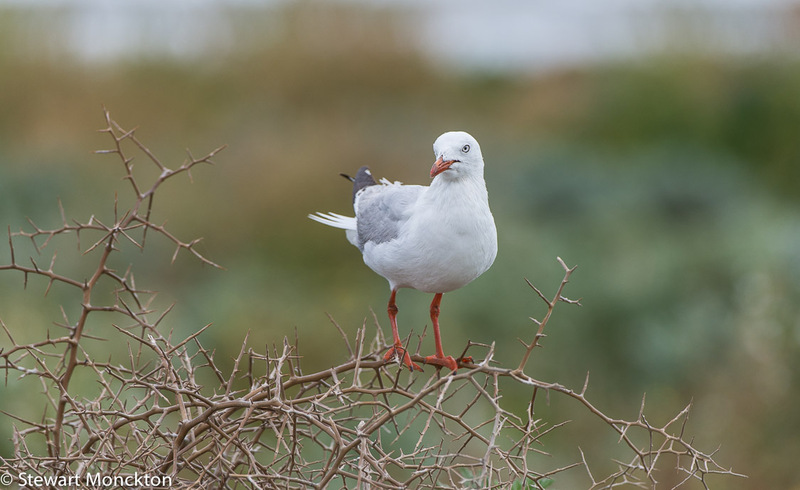 This is another bird that has been reclassified recently and was formally placed in the genus Larus, and many references on the web still call it that. Australia was once known as New Holland and a number of species have the specific name novaehollandiae. I think its a bit of a shame the name changed really, because the old name meant the "ravenous sea bird for New Holland" - which, apart from the name of the country is a decent description of this bird! The adults are about 40 cm long - which is just a bit bigger than a Black-Headed Gull or a Laughing Gull - and as ever for gulls, they sport a fine set of white and grey feathers. In full breeding condition the legs and beak are bright red. This bird is just past its best on the red front! It was only when I had a look at the images when I got home that I noticed just how spiky the bush this bird is in looks - I don't normally do this, but I can't help but think that the bird is saying "ouch"! 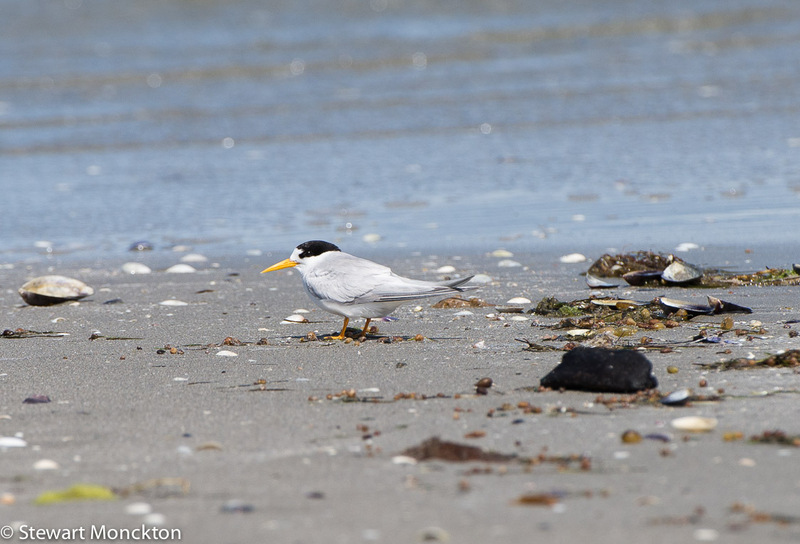 These pictures were taken on Mud Islands, just off the coast of Queenscliff, on the same trip that produced the Crested Terns from last week. If you are in this part of the world, its a trip you should consider. 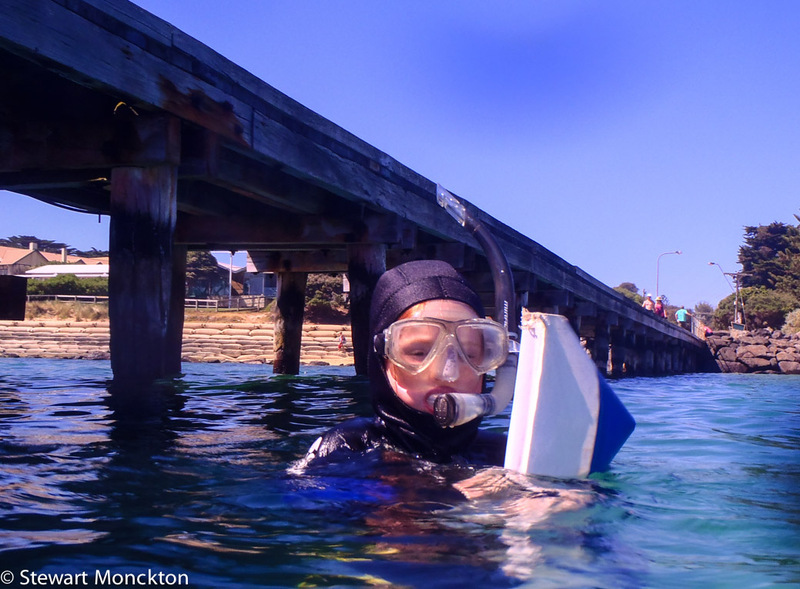 Over the weekend P and me had a little adventure - snorkelling in search of Weedy Sea Dragons below the pier at Portsea in Victoria. The weekend was hot. I mean really hot. So, being in the water was the only place to be. Even after our hot weather the water is far from tropical, so we were both suited up to stay warm. Small people get colder faster than larger ones - its all to do with surface area and volume, but I'm straying dangerously close to Year 9 science again. 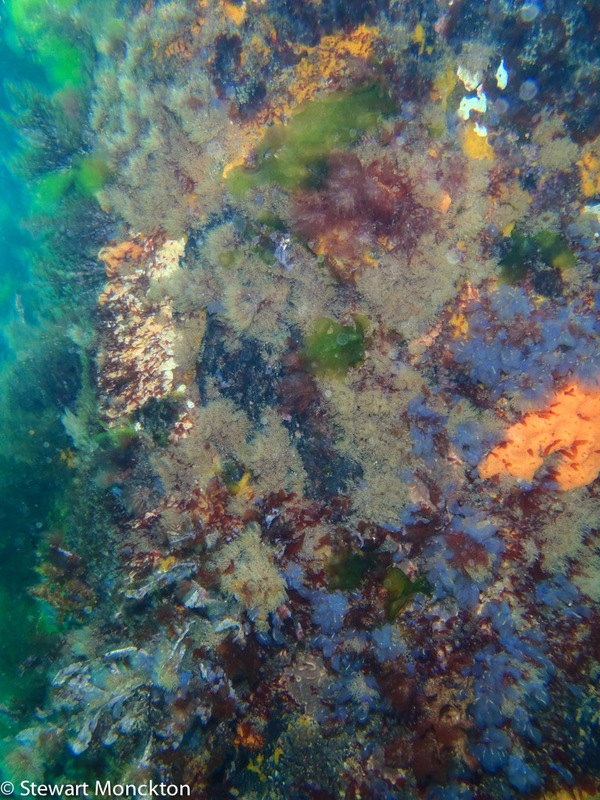 Unfortunately, the Weedy Sea Dragons were shy at the time - and we did not see any. (Now in case any of you think this is another crazy Stewart M kind of joke here is a link to a page about these fish - you will understand why we wanted to see them!) I've seen them under the pier in the past - but not this time. However, there was more than enough to see. 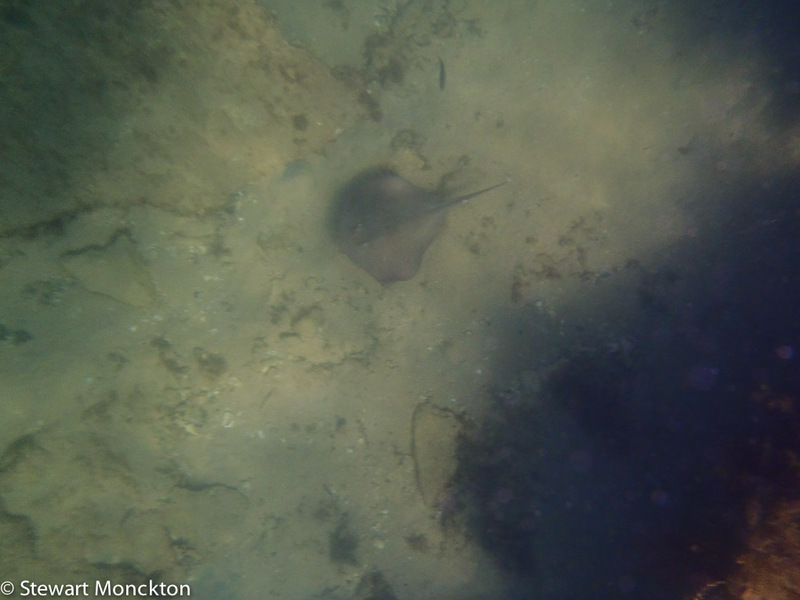 Most of the fish were too fast moving for my point and shoot - although this smooth stingray was slow enough for me to get a (rather unremarkable) picture. Its about the size of a chess board. 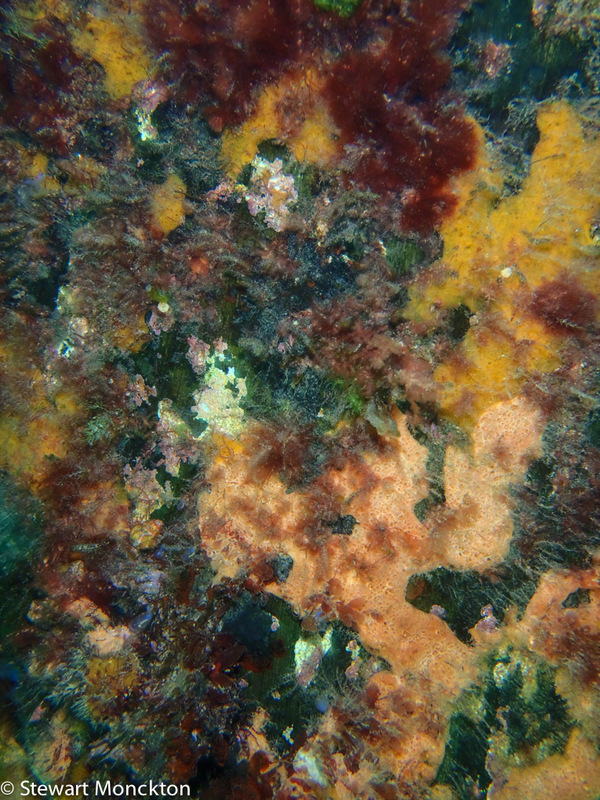 Most remarkable were the sponge gardens on the piles of the pier. Wonderful colours and strange forms. 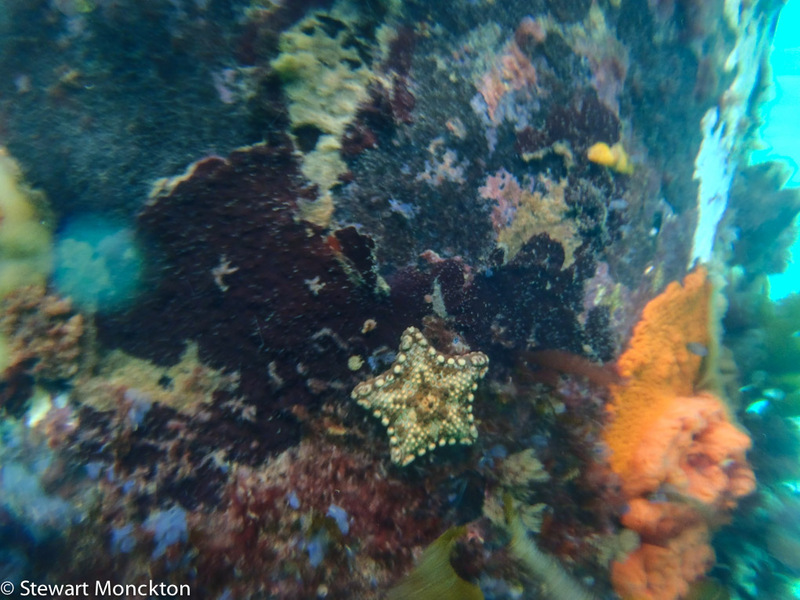 There were also lots of Biscuit Star starfish, although the current and waves did not make for easy picture taking! Finally, here is a picture of P in all her Marine Girl glory! Note the snippet of red hair, just to let me know it was still there. The blue cast to the whole picture is caused by the "under-water" white balance setting! 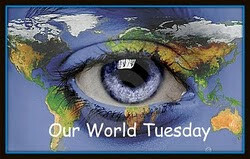 You can find more pictures from around the world at Our World Tuesday! cheers SM and MG! While this post sounds like it could be about some form of knitting equipment - it is actually about a dragonfly. 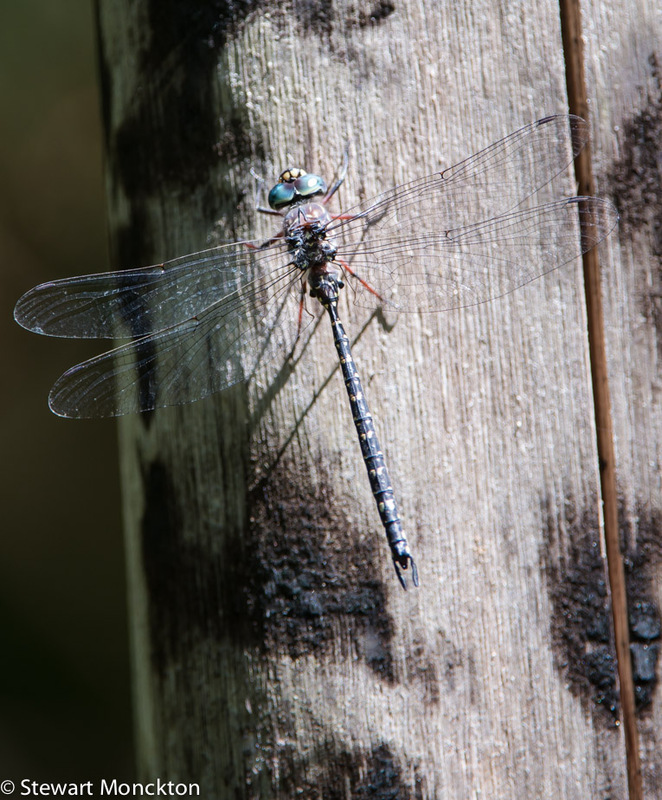 This is a Multi-spotted darner - I took the image in Kinglake last weekend. Not only do I like the picture, its another example of why I like the web. I am an absolute beginner when it comes to these insects - but I was able to find help on the web! Splendid. Also know as Austroaeschna multipunctata is common enough in forest areas near creeks - which is where I found it. More close up shots at Macro Monday 2 and I Heart Macro. 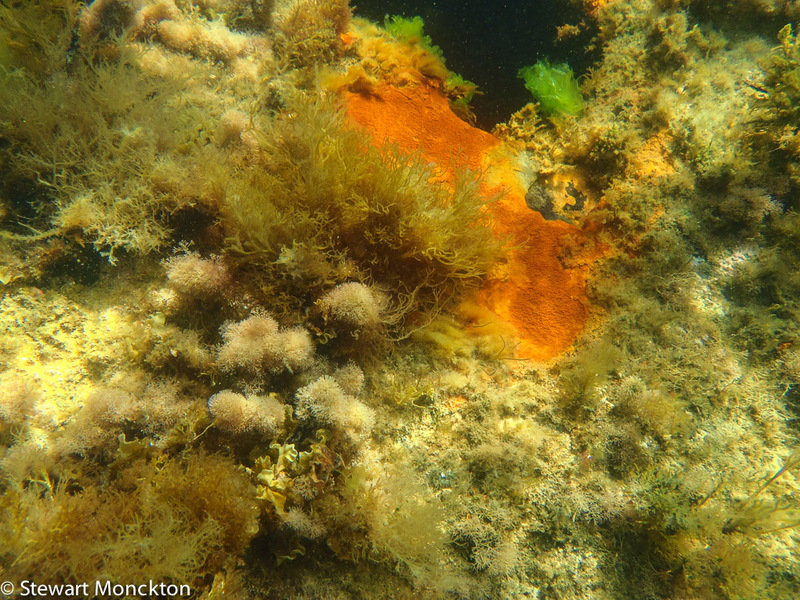 I am a very long way behind with comments at present - spent the weekend away with, mostly underwater, with my daughter!